TYR Size Chart Sleek and straightforward, the TYR® Solid Maxfit Swimsuit provides the swim performance you need from training to competition. It's just that simple. Maxfit delivers full coverage with wide straps and a moderate leg line. Xtra Life LYCRA® material provides a beautiful, long-lasting fit that resists chlorine five to ten times longer than traditional spandex swimwear. UPF 50+ fabrication protects your skin during outdoor activity by blocking harmful Ultraviolet A and Ultraviolet B rays (UVA and UVB). Shallow scoop neck with wide shoulder straps. X-back construction allows arms complete range of movement. Wide keyhole back cutout. Brandmark at upper left chest. Body: 80% recycled nylon, 20% Xtra Life Lycra® spandex;Lining: 76% polyester, 24% spandex. Hand wash cold, line dry. Made in the U.S.A. and Imported. If you're not fully satisfied with your purchase, you are welcome to return any unworn and unwashed items with tags intact and original packaging included. The women's Solid Maxback Swim Suit from TYR features a Maxback design for increased speed and reduced drag in the water. The form-flattering suit offers wide strap construction for maximum support, so you can concentrate on your swim. 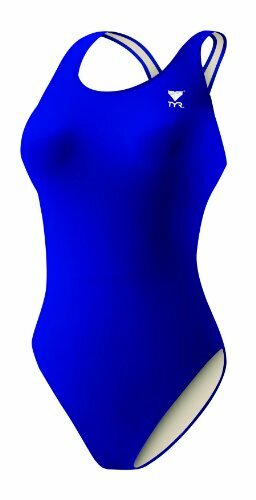 Built to last five to ten times longer than traditional spandex swimwear, the Maxback Suit features Xtra Life Lycra construction blended with nylon for increased support, shape retention, and durability.